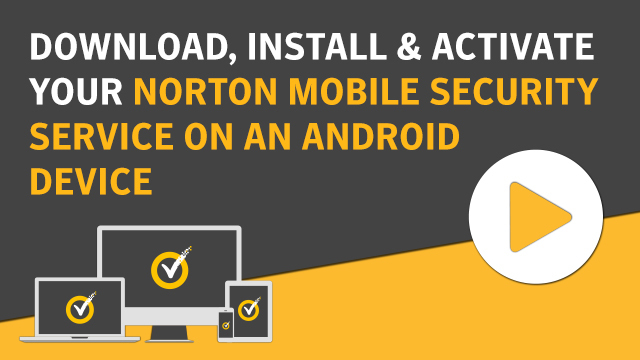 You can directly download and install Norton Mobile Security on your mobile devices, or you can send an email with download instructions and access it on your mobile device. If you do not have a Norton account, click Create account, and complete the sign-up process. In the Norton Setup window, move your mouse over Download Norton, and then click Send a Download Link. Type an email address you can access on your device, and click the send icon . An email is sent to the email address with instructions to install the Norton product. Click Done. On the device where you want to install Norton, find and open the email that you received from "The Norton Team", and tap Download Now. The download link opens the Norton Setup page in your browser. In the Norton Setup window, tap Download Now or Install. You are redirected to the Norton Security and Antivirus page on the Google Play Store or App Store. Tap Install to start the installation. Follow the on-screen instructions to install the app. On your Android device, tap here to be redirected to the Norton Mobile Security page in Google Play Store. Tap Install, and then tap Accept to install the app. When the installation finishes, tap Open. Norton Mobile Security performs the initial setup and runs LiveUpdate, Anti-Malware scan, and App Advisor scan. When the setup is complete, you need to sign in to your Norton account to make use of all the features of Norton Mobile Security. In the top-left corner, tap the menu icon , and then tap Sign in. Type your Norton account email address and password, and then tap Sign In. Make sure to use the same email address and password that was used to purchase Norton Mobile Security or your Norton product that includes Norton Mobile Security (such as Norton Security or Norton 360 Multi-Device). If you have not activated your Norton Mobile Security subscription yet, see Activate Norton Mobile Security. If you see any problems with installing Norton Mobile Security, make sure that your device has the latest version of Google Play application, and all of the latest system updates installed. Norton Mobile Security installation is now complete. To use the Anti-Theft, Anti-Malware, and Web Protection features, you need to enable the Device Administrator and Norton Security Service. Do the following to enable these settings. You need to turn on the Location settings on your device to activate the Anti-Theft feature. At the bottom of the main screen, tap the Home icon . In the Device Administrator screen, tap Setup. On Android 9.x or later devices, tap Activate this device admin app. On Android 8.x or earlier devices, tap Activate. Tap Allow twice to complete setting up the Anti-Theft feature on your device. The Anti-Malware feature is enabled automatically once you complete the following steps. For Android 7.x or earlier devices, Anti-Malware is enabled by default. At the bottom of the main screen, tap the Online icon , and then tap Web protection. In the Web Protection screen, next to Setup is required, tap the status indicator, and then tap TURN ON. In the Accessibility settings screen, tap Norton Security Service, and then move the slider to turn it on. On Android 7.x or later devices: In the Let app always run in background? screen, tap Allow. On Android 6.x devices: In the Ignore battery optimizations? screen, tap Yes. On your iOS device, tap here to be redirected to the Norton Security app in App Store. Tap GET to download and install the app. Tap OPEN after the completion of download and install. Read and accept the Norton license agreement and privacy notice. Tap GET STARTED and follow in-app directions.